We received a parcel from Estonia today; a neighbor to both Russia and Latvia. The contents are mummified in layers of cardboard and plastic but we’re looking forward to an unboxing video and reviews coming in the very near future. In the meantime it’s a total guess at this delivery weighing in at just under 4kg. Skate socks are one of the most overlooked pieces of equipment. While everyone has their own preferences on what type of socks they like to use, wearing the thinnest sock you are comfortable with is recommended. A thinner sock will give you a better feel for the ice and it is less likely to bunch up inside the skate boot; causing discomfort. My ideal sock is not only thin, but has moisture wicking capabilities but it needs to be durable as well. Prior to these I have tried a variety of socks from the other more well known hockey equipment brands but I never found one that I fell in love with. They arrived shortly after and upon first inspection they were extremely soft and looked well made. I am in a Bauer Supreme Total ONE 7.5D Skate and I fit the Medium sized sock. I also prefer my sock length to be just under knee height. 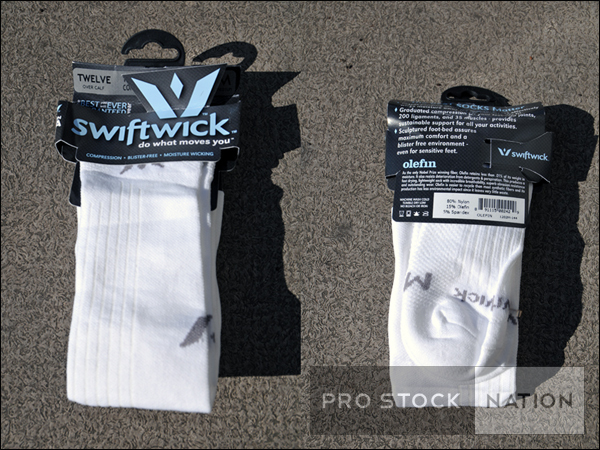 The Twelve is Swiftwick’s longest model for the hockey market but they do make other lengths as well. When I wore shorter socks it would cause my shin pads to smell. Despite the pads having a removable liner and washing it periodically, the smell would always come back. Another issue I had, with other socks of a similar length, was they would sag down and bunch up in the calf/shin areas. 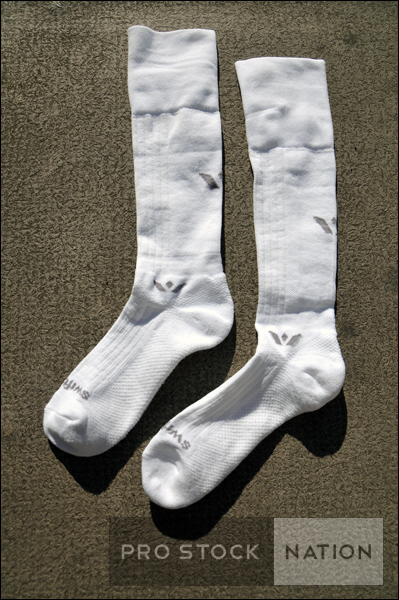 The Olefin Twelve is a compression fit and has cuffs at the top of the sock and ankle areas. It stays tight for the entire ice time but it doesn’t feel restricting at all. I have been wearing these socks for just over a year now (all of the photos are from when the socks were new) and they are still feeling soft and comfortable. There is very little wear on them and they are currently my go-to pair of socks. My only warning is to keep these out of the dryer as they do shrink significantly. I’m not sure if the wash/care instructions advised against this as I threw out the packaging prematurely but even with that small mishap the socks still stretch a great deal and they fit great. This Swiftwick product is an absolute pleasure to wear every time I go to the rink. The quality is top notch and as I mentioned earlier it is my go-to sock. I would highly recommend this sock and Swiftwick even has an offer to replace yours with a competitor’s product if you don’t like it. This product deserves a definite A+. Keep it out of the dryer! 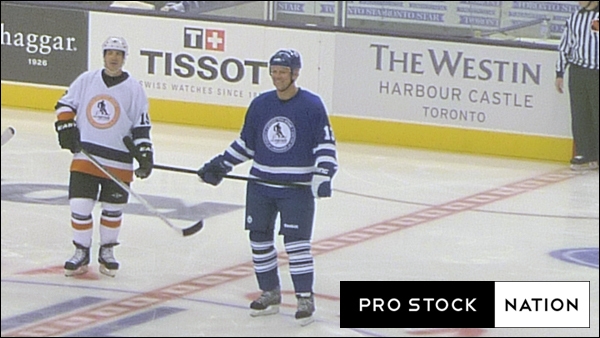 I visited Pro Hockey Life at the Vaughan Mills Outlet in Vaughn, Ontario a short while ago. Being from the west coast this was one of the shops that I only read about and saw videos of online. Even back home our so-called “Megastores” are only a fraction of the size of this giant. Upon walking into the store there are 4 mannequins fully decked out in the latest gear along with a very abstract hockey stick piece of art hanging from the ceiling. The pants, which are one of the most difficult pieces of merchandise to sort through and organize, were stored on massive shelves in the middle of the store. After walking through “Stick Alley” it leads you directly to the Rapid Shot. (Check out our previous posts and experiences with it: https://prostocknation.wordpress.com/tag/rapidshot/) For those of you unfamiliar with Rapid Shot it is the batting cage of hockey. 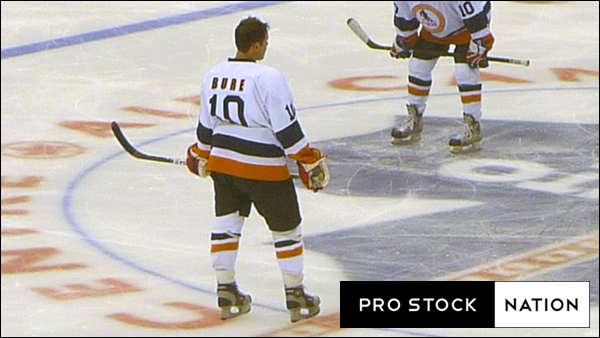 You are given 16 pucks to shoot and are rated based on shot speed, accuracy and reaction time. The Rapid Shot here is set up exactly like the one we tested before at Rogers Arena in Vancouver, BC. I really wish more stores had this installed as it will make the stick buying decision much quicker and easier. I have had many dilemmas contemplating which stick I should buy only going by the in-store feel. Some of the times I’ve purchased sticks that felt excellent in store but once it came time to using it on the ice I absolutely hated it. 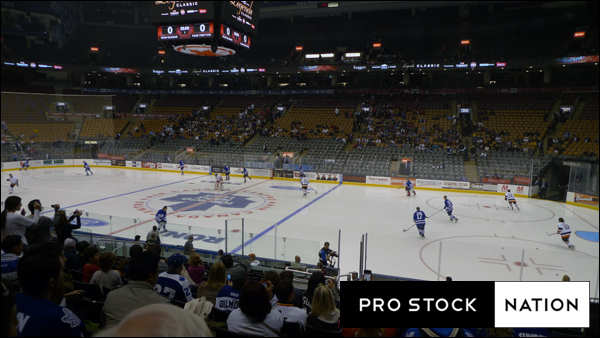 Pro Hockey Life in Vaughan, Ontario is a definite must visit if you are in the area. While I did not find any pro stock hockey equipment at this location I was still in awe at the size and selection available at this store. Make sure to give the Rapid Shot a try before you leave! With the Easton Mako 2 hockey stick being released tomorrow, it will also be the debut of the E28/Bjudstad pattern; better known by it’s more common name, “Kreps”. It is a toe curve with a dual lie designed to receive passes on the heel and shoot pucks off of the toe. It will be interesting to see how this new pattern fairs at the retail level as toe curves cater to a very niche market. In the past, the scarcity of finding one made it a very hot commodity. Stores often did not sell them and the only chance of getting your hands on one was to go Pro Stock. Rival company Warrior Hockey recently scrapped their toe curve, the Gionta W10 pattern, for 2013 (except for the DT2 Grip) due to poor sales in just two short years. CCM, in partnership with Taylormade Golf, have developed their newest top of the line stick, the RBZ. Typically sticks will be either mid-kick (load up for harder slap shots) or low-kick (quicker release.) The CCM RBZ is more of a hybrid between the two and will flex a few inches below your bottom hand. The RBZ also features “Speed Channels” in the blade. These Speed Channels are hollow cavities compared to other One Piece Composite sticks on the market that have a foam core. More on this later. 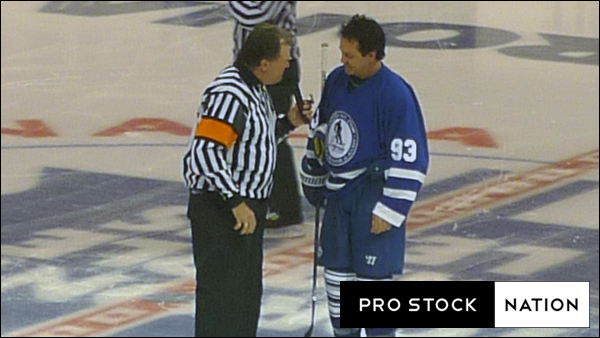 The lower third of the stick is white in color. Players in the past had the idea of spray painting their sticks black and using black tape in order to hide the puck better. Upon interviewing a few goalies they actually found it more difficult to see shots from a white stick with white tape on the ice surface. The majority of these goalies said they reacted more on the swing of the stick rather than tracking the puck itself. So after using the RBZ for several weeks, here’s my verdict. Aesthetics alone, it’s a beautiful looking stick. Compared with the competition, the key difference is the absence of foam inside the blade. Blades with a foam core have greater puck feel but will start feeling soft once the foam starts breaking down. On the contrary, blades with no foam will feel rigid for longer but at the cost of puck feel. This blade construction makes the RBZ a pure shooter’s stick. The puck pops off the blade effortlessly and I do feel like I am shooting with more velocity. However while passing and stick handling, there is absolutely no puck feel at all and there is lots of ping and vibrations. While “Strap a Rocket to the Puck” may be CCM’s marketing slogan for the RBZ, in reality it feels like Rocks are strapped to this stick. I’ll explain. Take any stick and stick handle a couple of pebbles around. That’s exactly how the RBZ feels. What’s even more puzzling is CCM has no plans to release a NON-grip version of this stick. When I am spending top dollar on a stick I expect to have as many options available to me. I prefer a stick without grip because I rotate through gloves with fresh palms quite often. 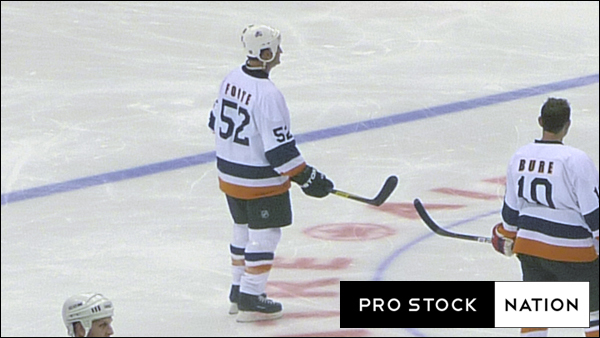 When we asked the local CCM rep about why the RBZ only comes in Grip, his answer was simply, “it sells better”. This may be acceptable for lower price point sticks but I find it unreasonable that all the other competitors can offer their top end sticks in a grip and non-grip model while CCM does not give the consumer this choice. The shaft shape is rounder than some of the more boxy sticks like the Easton Stealth and Bauer Supreme lines so it’s quite comfortable to hold for players with smaller hands. Durability-wise the RBZ’s blade has been very impressive and there have been very few reports from other users that deviate from this. Overall the stick is very well balanced despite me cutting off quite a few inches. 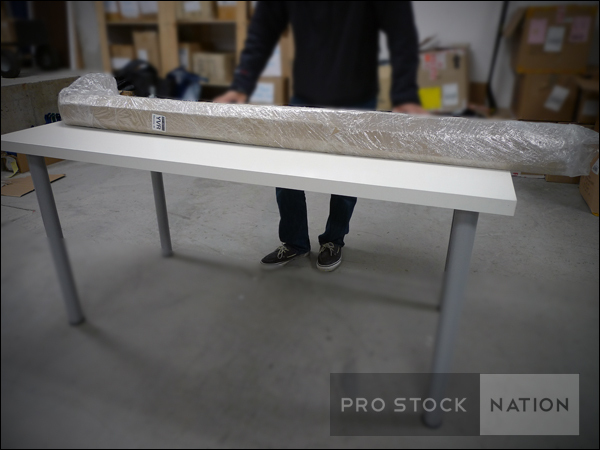 It feels like a quality stick in your hands. The RBZ shoots well but that’s about it. It is a significant improvement over the U+ CL (the two sticks we tested had major durability issues) but I don’t see myself purchasing this stick again compared to the Bauer Supreme sticks I’ve been using that have a great pop to them as well. The absence of a non-grip version really deters me from wanting to use this stick more often. I thought the RBZ was a good but not a great stick, it was a bit disappointing especially at this price point. Sports Experts is the largest sporting goods retailer in Quebec. They are known as a big box store that carries closeout merchandise. With Sports Experts being grouped under the FGL Sports Ltd. umbrella (Sportchek, Sport Mart, etc. 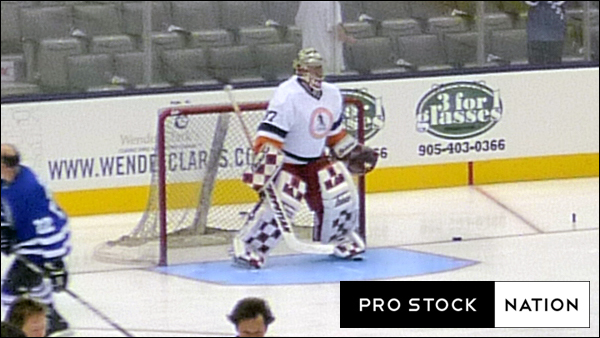 ), Pro Stock hockey gloves were one of the last things I expected to find at their Centre Commercial Rockland location in Mont Royal, Quebec. Sports Experts was a nice surprise. They weren’t on my list of places to visit while I was in Quebec but the next time I am back east I will definitely drop by a few more of their stores to see what unique gear is available.